Do fathers matter? Of course they do! 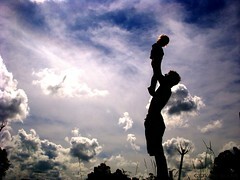 I was going to write a post about how much fathers matter, in honor of Father’s Day. Instead I found a great one, published recently in the New York post, called “Do fathers matter? A connection that’s deeper than we realize”. It’s so important these to recognize that, even though many people may not be in an ideal situation and still do very well, what’s generally best for children is to live with their mother and father. Here’s a salute to all of the dads, young, old, and deceased, who made a difference in their children’s lives by just being there.